PHOENIX – Phoenix senior Olivia Uttamsingh said she wants to be remembered by her classmates as someone who never wasted her time, which is one of the reasons she excelled in school and was named the valedictorian of the Class of 2015. 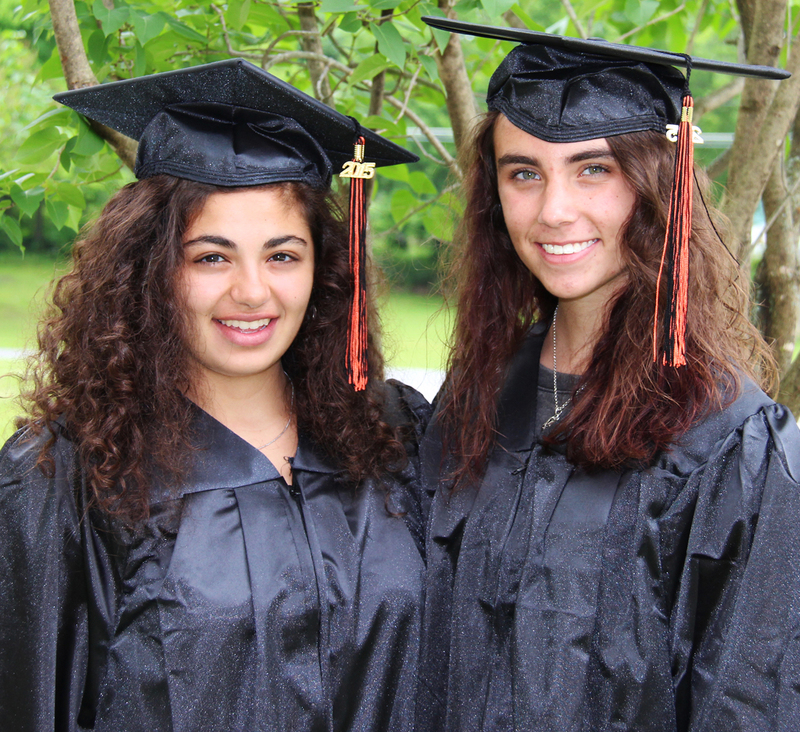 JCB High School valedictorian Olivia Uttamsingh (left) and salutatorian Ashley Centner. Olivia, the daughter of Catherine and Prakash Uttamsingh, has been involved in a bevy of activities throughout her four years at John C. Birdlebough High School. She was in several extracurricular clubs and school organizations that helped her explore the diverse opportunities available to Phoenix students. Olivia has seized many opportunities during her years of schooling and she is hoping to capitalize on even more opportunities at the University of Rochester, where she will spend her foreseeable future studying biomedical engineering. Ultimately, she said, she would like to move on to medical school and embark on a career as a pediatric surgeon. While she is eager to begin the next chapter of her life, Olivia noted that her time in the Phoenix Central School District created memories that will linger with her forever. With a strong internal drive to succeed, John C. Birdlebough High School senior Ashley Centner is not one to settle for mediocrity. Her work ethic has propelled her toward the top of her graduating class and her 102.68 average earned her the distinction as salutatorian. Ashley, the daughter of Rene and Christopher Centner, said her family and friends have always been there to encourage her to chase her dreams. She will go after those dreams at the University of Albany in the fall, where she will study biochemistry and molecular biology. Although her passion for science will shape her career, Ashley noted that an English class at JCB was one of her most memorable experiences; not because of the subject but because of the teacher. Under the tutelage of KC Bechard, the salutatorian learned to love a class that she had previously detested. “Mrs. Bechard gave me constructive criticism and it’s something I really needed,” Ashley said. In addition to being tested in the classroom, Ashley also took on athletic challenges and other extracurricular activities. She was a member of the basketball team and participated in school organizations such as student council, the principal’s cabinet, National Honor Society and leadership group. As she prepares to embrace success in college and in her future, Ashley stressed the importance of having a strong sense of self and encouraged her classmates to do the same.